"There is a natural trade-off between functional and aesthetic richness. "You can't have something that is at the same time both an excellent high-functionality application and a great work of online art. "That point falls outside the sphere of design. The reason for this is that things that have the highest aesthetic beauty and impact cause you to stop and look at them, while things that are most functionally effective help you to do the job you want to achieve without being looked at. The two can't happen at the same time. "The most functional web sites are those that are information-rich, quick to load and totally obvious to use. While they can also be pleasing and attractive, their focus on function would be compromised if they were extremely visually impacting. Have you ever put a huge amount of effort into creating wall charts to use in workshops? Written a facilitators manual which took you hours to do? Then you have a meeting of your peers and they want, in the name of progress, to make some changes to some of the wording and categorisations used in the material you all use. You are reluctant to agree to the change because you will have to completely re-do your wall charts and it will take hours to re do the manuals, not to mention the cost of having new print runs!! This is an example of how effort involved in making changes to material, resulting in a total lack of motivation to engage in redoing or editing it, can significantly impede change and progress. In the case of form, there's deep structure (internal structure) and surface structure (look/feel/ appearance) which also need to be separated. 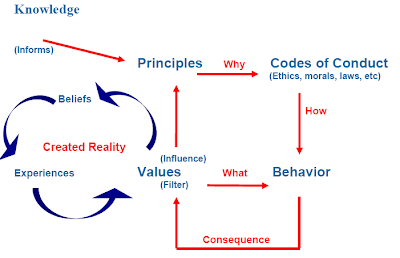 Let's use the Minessence Values Framework (MVF) as case example to illustrate how this works in practise. There are editors for everything: which values are associated with which skills, names of the clusters and the world-views, names and descriptions of the Motivation Fields, etc. The editors are powered by software which resides at the process level. They are implemented in ASP.NET 2 and 4 by IT specialists. The editors enable non-technical people to keep the MVF up-to-date and relevant to its users. Only the X, Y, W (where X & Y are the coordinates in points to the left and top of the text to be printed. W is the width of the text.) and font settings need to be changed in the code above to make the values appear in the desired location on a suppied PDF page template. At present these parameters have to be altered by by an IT person to suit each supplied template. However, the ultimate goal is to enable value consultants to do this for themselves (inclusing uploading the template) via a special page set up for them on the web. This is the domain of people who use the MVF, mainly Value Consultants (VCs). Typically, a VC will design a chart, document, single or multi-page report, leaving sections blank where information from the MVF is to be inserted. The VC's material can be as elaborate and aesthetically rich as the VC desires. It is supplied to the IT people as a PDF. A change to any part of the MVF is automatically reflected in any document/chart/report of any VC at the instant it is required/generated. Thus, by separating function and form in the implementation of the Minessence Values Framework a degree of nimbleness has been achieved in its ability to adapt to the requirements of changing times.